We provide fully insured and registered care for customers’ pets in the stress free environment of their own home. Take the lead in a new career! 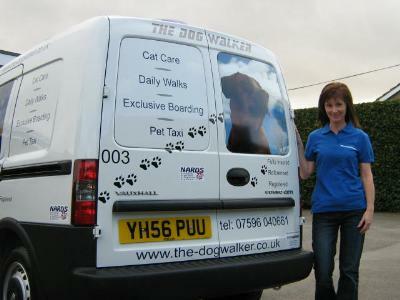 Founded by pet lover Richie Barlow in 2006, The Dog Walker is one of the UKs largest pet care and wellbeing specialists. We provide fully insured and registered care for customers’ pets in the stress-free environment of their own home. While our customers go about their busy lives, we walk their dogs and even offer exclusive home boarding. We provide a pet taxi service for important events such as weddings, as well as those unfortunate vet visits. At the Dog Walker we also provide in-house care for cats too, making it a less stressful experience for felines. Having been a dog and cat owner all his life and then working at a range of kennels in Yorkshire, dealing with up to 80 cats and 55 dogs at any one time, Richie was convinced that there was a better way to care for our furry friends. He saw how pets often felt distressed by howling and barking in an unfamiliar environment and that they feel safer and more relaxed in their own home surroundings. We are now 12-years strong and our accolades stack up along the way. We are winners of 'Best Small Business 2015', Deborah Meadens regional winner for 'Local Business Accelerators 2012' and proud owner of 'Young Entrepreneur of the Year 2013'. As our efforts in business are becoming widely known, The Dog Walker has been approached by a number of TV companies, including Dragons Den and ITV documentaries to name a few. Due to Richies passion for the business, we've been appearing in national and regional newspapers, on radio stations and blogs with Richie being named one of Insider Magazines '42 under 42'. The success of The Dog Walker has seen competitors benefit from our hard work as we have set the standard for professional dog-walking and many now copy our format. York has some fantastic walks ranging from strolls alongside the River Ouse to walks in Hagg Woods and Wheldrake Woods to name just a few and you are always guaranteed to meet other dog lovers enjoying these great walks. An animal loving heavy goods vehicle driver is the latest new franchisee to join award-winning business The Dog Walker. Ben is taking over the Ilkley area franchise and plans to expand the daily dog walks and dog and cat boarding he offers, as well as taking a leading role in the business, working alongside founder and managing director - Richie Womersley. Richie is the best dog walker one could wish for. Reliable, trustworthy, friendly, animal lover and dog walker extraordinaire. During the time we lived in Boston Spa he walked Milo without fail come rain, shine, snow or hail. I honestly don't recall him missing a single day. Milo loves him to bits and we miss him now that we've moved. I wonder how we can tempt him to move down South? The service is completely reliable and professional and I feel totally relaxed knowing my house keys are in safe hands. They are really flexible with dates and can accommodate last-min requests if you need to change arrangements at the last minute. I would highly recommend them to anyone who is looking for a dog walker or home boarding - it's a real joy to know your pet is in the safe hands of someone who so obviously loves dogs!